There are many types of contact center dashboards that managers are using today. Obviously the most important dashboard is one that will work for you. From a managers point of view the dashboard should contain real time and historical data, it should include critical KPI’s and metrics, and it should have layers of content and it should be available regardless where the manager is when they need it. Real time data will focus on group / split skill KPI’s with overall agent status added in. The target is to see how the call center is performing and if agents that are available are handling calls, emails and chats. Managers that want more real time information can scan through the second layer of this dashboard. In this example the manager clicked on the PVY Fund to see why 23 staffed agents were all unavailable. In this agent states layer of the dashboard the manager focuses on three items: State, Reason Code and total Abandoned calls. If an agent is in an unproductive state then the manager reviews the time the agent has been in that state. If the time is short it is forgotten, if the time is long then it is mentioned to the agent’s supervisor. This contact center is in the financial industry managing mutual fund customers both existing and new. Agents that are unproductive are noticed quickly by the manager and the agent’s supervisor. The total abandoned calls for the PVY fund is watched closely by this manager. Abandoned calls, according to the manager, are lost revenue. This manager calculates the daily, weekly and monthly “lost” revenue on a separate spreadsheet and shares that with the supervisors. The supervisors per fund then discuss this with the agents with the most abandoned calls. The historical portion of the manager’s dashboard shows how the agents have performed over certain time frames. Agents are looking for raises, new positions within the call center and have their own justifications for asking for these changes. Managers with historical data can immediately respond with facts. The two key points in this layer of the dashboard are the working state time and the nonworking state time. Working State is being productive while NonWorking is unproductive. Breaks, lunch, training, coaching and other logged off status are considered to be unproductive. This type of dashboard is not a default or standard option with ACD reports. Some contact centers are adding in email and chat work to the productive numbers. It is important for contact centers to accurately set up logged out status options. This historical layer of the dashboard goes back to one year. The time frames on the report were fairly standard requests that managers ask for starting with yesterday and including quarterly status reports. It is also easy to see that this agent was on vacation during the 3 month time frame when compared to one month and 6 months. 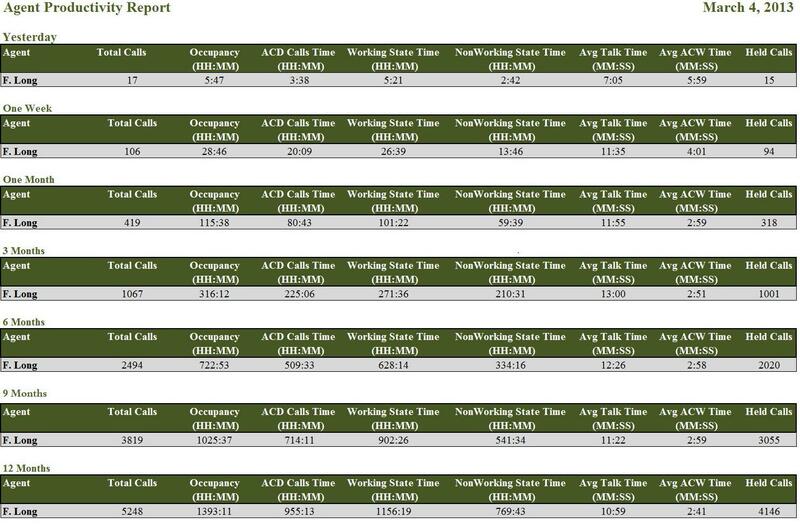 There are other key metrics on this dashboard: Occupancy, Avg Talk time and Avg ACW time. These metrics confirm with the manager the agents idle time and productivity time. One of the most interesting differences between actual call center dashboards and the examples that you find when you Google Call Center Dashboard is the lack of charts and graphs. Spectrum has the ability to include graphs, charts, gauges and other attractive features to a dashboard, but contact center managers quickly find that not enough data is available to them when they view a graphical dashboard. They move over to a spreadsheet view of the data and eliminate or reduce the request for charts and gauges on their report. Mobility has always been an important functionality for contact center managers. The job requires the manager to be at corporate meetings, to assist the staff at their desks, travel to industry events and contact center training and work from home. 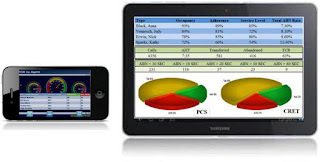 A managers dashboard should be available on a desktop, tablet PC, web based report or even a smart phone. A manager’s dashboard requires multiple layers of content from real-time to historical on the group level down to the agent level. The dashboard also needs to available to the mobile manager via remote connectivity so the manager is able to be aware of the contact center status at all times. A dashboard that does not meet these requirements loses value rapidly. The real time and historical report shown at the top of this article is based upon mutual fund contact center manager’s requirements. The names of the funds and agent names have been altered to protect confidentiality. All numeric values seen in the images are actual values. 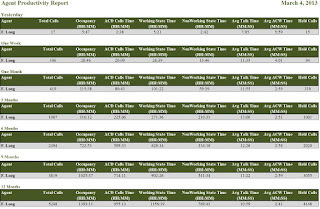 Spectrum is a leading provider of Unified Contact Center Reporting. Contact Spectrum today to learn more about dashboards for your contact center.